The recent sighting of a great white shark pup off the New Jersey coastline could point to evidence of a nursery for the feared fish, according to experts. Dan Radel of the Asbury Park Press reports that a group of friends fishing off the tip of Sandy Hook on Saturday caught a juvenile great white shark, letting it back into the ocean in compliance with the law. Oceanographers told Radel that the catch may suggest a nursery of the sharks forming in the New York Bight, an area of the Atlantic Ocean extending from the tip of Cape May to Montauk Point on Long Island. "The New York Bight has long been known to be a nursery area — based on historic incidental catches of young-of-the-year," said Michael L. Domeier, president of the Marine Conservation Science Institute, located in Hawaii. Saturday's encounter follows a summer filled with reports of shark sightings along the Jersey Shore, and farther south, attacks. The Carolinas' coasts have seen a number of attacks on swimmers this season, injuring some severely. Sightings off of the Garden State have ranged from Margate to Sea Isle City to Avalon. In May, a great white tagged by the nonprofit research organization OCEARCH made its way up the Jersey Shore. 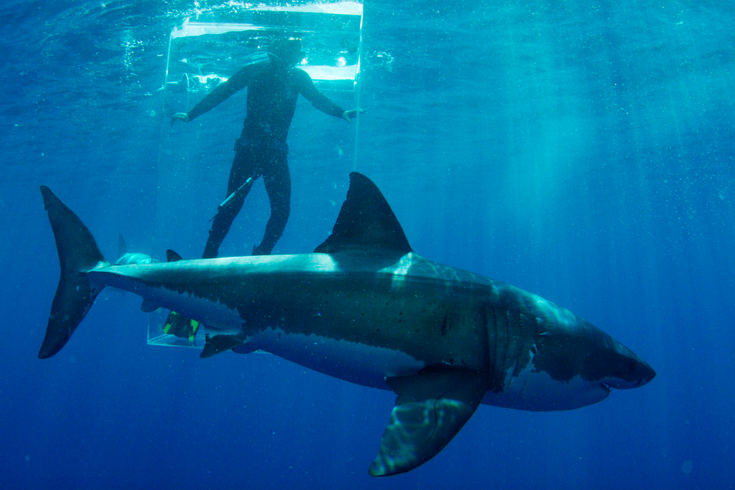 Despite the "Jaws" fever, evidence actually shows that risks of shark attacks are down. A recent study from researchers at Stanford University and the Lenfest Ocean Center says that media attention could be responsible for the increased anxiety over sharks and that attacks are not occurring more frequently than decades ago.